From „A“ to „Z“: Here you will find a list of important services and additional offers for TK members. Acupuncture has been added to the List of Benefits of the statutory health insurance as from 1st January 2007. Patients with chronic pain in the back or knee can consult correspondingly qualified doctors for a course of acupuncture treatment with needles. The „Model Project Acupuncture“ run by the Techniker Krankenkasse that ended on 31st December 2006 has made a considerable contribution towards the decision to add acupuncture to the List of Benefits. It just takes a phone call: The TK-ReiseTelefon offers you health information before your departure and practical help during your journey. What should you have in your travel first aid kit? Which vaccinations are required for the country of destination? Where can I find the next German- or English-speaking doctor? Qualified doctors and medical staff of the Techniker Krankenkasse will answer these and any other questions – 24 hours a day, 365 days a year. The telephone number of the TK-ReiseTelefon: +49-1802-85 00 05. For TK members the service is free of charge except for the call charges. And: You can also ask the TK-ReiseTelefon to phone you back in the foreign country. Would you like to receive money simply for keeping fit? The TK Bonus Programme will provide it. The Techniker Krankenkasse is rewarding health-conscious behaviour. If you are active at sports and look after your body, you can save money. The Bonus Programme applies for instance in case you are an active member in a sports club or fitness centre or go jogging on a regular basis. According to the number of measures you might receive 30, 60 or even 90 Euro from the TK. From prevention to treatment. The TK covers all the costs of services by statutory dentists. This applies also to false teeth and crowns if your monthly gross income does not exceed a certain limit. You can claim exemption from the statutory co-payment – for example for medicines and hospital treatment - if you have already spent on it two percent of all your annual gross income sources for your costs of living. For the chronically sick the border lies at one percent. You wish to improve your fitness? Reduce stress? Or increase your agility? The TK provides you with your personal fitness coach on the Internet. Free of charge. You can choose between more than 350 exercises (partly on video). In addition the fitness coach will compile your weekly training plan. Of course you determine your individual training goal yourself. For 24 hours a day and 365 days a year the qualified doctors and medical staff of the TK are available by phone or by e-mail to answer your specialised medical queries. This healthline is available on: 01802 / 64 85 64 (from six cent per call/depending on the provider). You are of the opinion that in your case there has been a possible error in treatment? 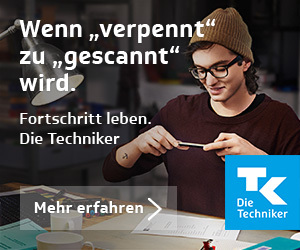 Consult the Techniker Krankenkasse! The TK specialists will help you to clarify the facts. The TK makes the preparation for your professional life easier for you. As a graduated student with the matriculation tariff you are still fully insured with us for up to six further months. This means that you only pay 87.80 Euro per month for your health insurance after the 14th semester or after your 30th birthday. A further 16.15 Euro are due for nursing care insurance, or 18.22 Euro if you have no children. The condition: You continue studying and your income subject to contributions does not lie above 828,33 Euro per month (Status 1.10.2008). The Techniker Krankenkasse covers the costs of treatment by a statutory health insurance physician or approved psychotherapist. The TK will cover – after deduction of the co-payment – the costs of ambulance transport to hospital or to in-patient prevention or rehabilitation measures. The TK covers the costs of remedies and aids up to the statutory amount (less the co-payment).